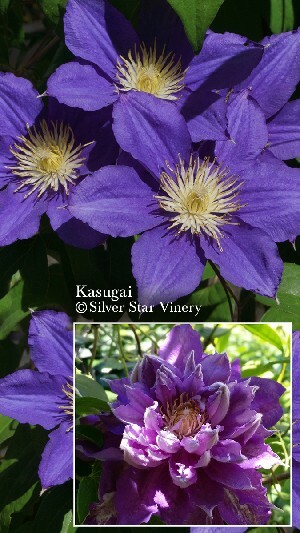 Kasugai is a lovely Violet Blue flowering clematis which seems to always be in flower here. I am very impressed with the growth and flower power it has. I was surprised in the spring of 2016 with large double darker flowers with a streak of white. I have been very ill and had not been able to cut Kasugai back. Once these flowers were done I cut it back hard to get fast regrowth and loads of single flowers. It is listed as a type 3 hard prune clematis but I know I will be not pruning it that way any more. I will layer it in order to get layers of both single and doubles. Easy to grow and highly recommended!